GoldenEye 007 is a 2010 first-person shooter video game developed by Eurocom and published by Activision for the Wii video game console, and the Nintendo DS handheld game console being developed by n-Space. It is based on the 1995 James Bond film GoldenEye. The game was officially announced by Nintendo at their E3 2010 conference presentation. The game was released on November 2, 2010, as was another James Bond game, Blood Stone 007. Although Pierce Brosnan starred as Bond in GoldenEye and was featured in the 1997 game, current Bond actor Daniel Craig's likeness and voice is featured in the game. Judi Dench, who portrayed M in GoldenEye, voices her character. The main characters have all been given different character models to prevent confusion from the critically acclaimed N64 original GoldenEye 007. David Arnold, the composer of every subsequent Bond film since Tomorrow Never Dies, composed the game's score. Nicole Scherzinger performs the title song, a cover version of the original movie theme. The game's script is penned by Bruce Feirstein, the writer of the original 1995 GoldenEye film, who has described several changes made to update the story in the fifteen years since its release. For example, Alec Trevelyan's motivations have changed as the character's backstory involving a Lienz Cossack father would make Trevelyan seventy-one years old in 2010, whilst Valentin Zukovsky no longer has any connection to the KGB. Rory Kinnear will reprise his role from Quantum of Solace as Bill Tanner, M's Chief of Staff. 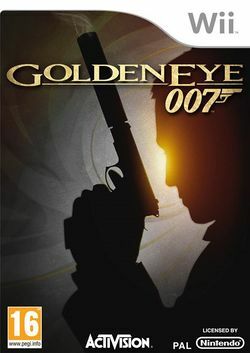 This game has been updated for the Xbox 360 and PlayStation 3 retitled "GoldenEye 007 Reloaded" with exclusive features added and the time trial cut for its release. This page was last edited on 10 July 2017, at 12:13.